wassailing refers to singing carols door to door wishing good health… the Christmas spirit often made the rich a little more generous than usual, and bands of beggars and orphans used to dance their way through the snowy streets of England, offering to sing good cheer and to tell good fortune if the householder would give them a drink from his wassail bowl or a penny or a pork pie or, let them stand for a few minutes beside the warmth of his hearth. The wassail bowl itself was a hearty combination of hot ale or beer and spices and mead, just alcoholic enough to warm tingling toes and fingers of the singers. How interesting! How things have changed! 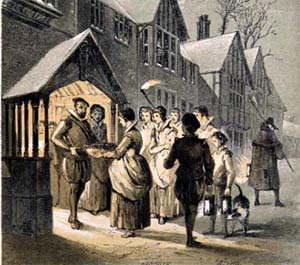 Today, we often think of caroling as an act of generosity on the part of the carolers. Groups often go caroling in places like nursing homes and hospital wards, bringing the “spirit of the season” to people who might feel cut off. But the wassailers of old were the ones in need of charity and good will. I appreciate these reminders of the complexity of our traditions, and the ways that Christmas is about the experience of deep need. To read the Christmas lessons, you feel that the whole earth longed for the birth of Jesus. And we are longing still. wonderful meditation — spot on!! !